Jason Reitman has been one of my favourite director’s for some time, with films such as ‘Young Adult‘, ‘Up In The Air‘ and ‘Juno‘ some of the finest modern examples of balancing comedy and drama to great effect. Disappointingly, this year he has released two films (in the UK at least), and both have been fairly mediocre efforts, with this film following up the lacklustre ‘Labor Day‘. 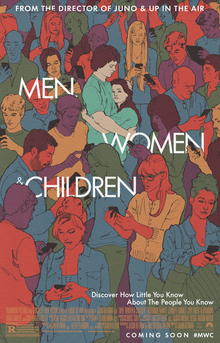 The biggest problem with ‘Men, Women & Children‘, an ensemble drama about the use of the internet, social media and technology, is it’s never clear what it wants its message to be, and it comes across heavy handed in its approach at times. The problems begin with a corny voiceover that follows the satellite space shuttle ‘Voyager‘ throughout our galaxy, with basic dialogue that introduces us to some of the key characters. This voiceover pops up at various points throughout the film, and is never anything less than annoying. I did like some aspects of the film, hence the 3 star rating. The ensemble nature of the drama tends to lead to some stories resonating stronger than others, and this is definitely the case here. I felt the stale relationship between Adam Sandler and Rosemarie DeWitt’s characters was well depicted and well acted by both actors (it’s nice to see Sandler away from the terrible comedy films he spends most of his time in these days), and the teenage romance between Ansel Elgort and Kaitlyn Dever is strong throughout, largely because both are talented young actors, although it takes a fatal misstep towards the end that is one of the best examples of the heavy handed reach off the plot whilst searching for meaning. Dean Norris is good as well, but a lot of the other characters feel like ciphers and it’s difficult to believe some of the choices characters make at times. To be honest, I’m just not sure what Reitman’s message is (I appreciate he was adapting from a novel, so the script faults may partly lie there). At times (through Jennifer Garner’s character), he’s trying to tell a story of an over protective mother who does more damage than good through her constant surveilling of her daughter’s internet and mobile phone activity, whilst at other times he wants to make a point about how the internet and social media drives teenagers to have unrealistic expectations of beauty. There’s some interesting ideas at play, but to be honest, the dangers of the internet and technology, and how it’s changed the way we live our lives has been done to death, and the scattergun approach of ‘Men, Women & Children‘, never really tells us anything new or interesting about the subject.